The internet has received a substantial amount of blame for the recent increase in political polarisation. Using US data, this column argues that, in fact, the internet has played no significant role in a generally increasing trend of political polarisation that goes back at least to the 1970s. The results highlight the importance of looking beyond convenient narrative explanations, and the need for a deeper understanding of the drivers of political sentiment. A growing body of literature suggests that political polarisation among the US electorate has risen in recent years (e.g. Abramowitz and Saunders 2008, Iyengar et al. 2012). In 1994, roughly 20% of party affiliates had ‘very unfavourable’ views of the other party. By 2016, this number had risen to over 55%, and it shows no signs of slowing (Pew Research 2016). Between 1994 and 2014, the share of Americans with strongly consistent ideological views across a range of policy questions more than doubled – from 10% to over 20% (Pew Research 2014). Interest in political polarisation is also at an all-time high. Google Trends shows that searches related to political polarisation in the US were higher in November 2016 than any other election month since monitoring began in 2004.1 Gentzkow (2016) finds similar results for references to political polarisation in data from Google Books Ngram Viewer between 1950 and 2008. Popular books by Eli Pariser (2011) and Cass Sunstein (2001, 2009, 2017) expound on this notion of the internet acting as a ‘filter bubble’ or ‘echo chamber’. There is strong empirical evidence that individuals do find like-minded sources online and are more likely to be connected to like-minded individuals on social media. Previous work has shown segregation in links across political blogs (Adamic and Glance 2005), website visits (Gentzkow and Shapiro 2011), political retweets on Twitter (Conover et al. 2011), article sharing and clicking on social media (An et al. 2014, Bakshy et al. 2014, Flaxman et al. 2016), and political homophily on Twitter (Colleoni et al. 2014, Gruzd and Roy 2014, Halberstam and Knight 2016). Source: Gentzkow and Shapiro (2011). However, when comparisons are made between offline and online sources, studies find similar levels of segregation. 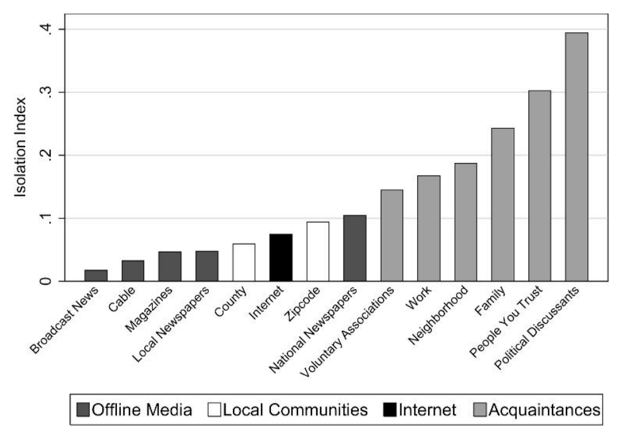 Figure 1, taken from Gentzkow and Shapiro (2011), shows that segregation across website visits is smaller than segregation across national newspapers, but larger than segregation across local newspapers. Halberstam and Knight (2016) examine political networks on Twitter and find similar levels of segregation in the Twitter political networks as in offline political networks. Furthermore, while suggestive, segregation across information sources on the internet is neither necessary nor sufficient for the internet to increase polarisation. Source: Boxell et al. (forthcoming). In a recent paper, my co-authors and I take a direct approach to examining the relationship between the internet and political polarisation using American National Election Studies survey data to compare polarisation trends across demographic groups with differential access to online information (Boxell et al. forthcoming). To reduce the sensitivity of our findings to the specific measure of political polarisation, we create a normalised index of eight measures that have been used in the literature before, such as a measure of ideological consistency from Abramowitz and Saunders (2008), and the partisan sorting measure of Mason (2015). Figure 2 shows the trend in our index from 1972 to 2016 (which is normalised to have a value of one in 1996). We see a steady upward trend in polarisation over the time period, and no sign of a breakpoint in the trend that corresponds with the rise of the internet. The pre-1996 trend alone is suggestive of a limited role for the internet in explaining political polarisation. In addition, as shown in Figure 3, polarisation grew more quickly for the elderly (ages 65+ and 75+) than for young adults (ages 18-39) between 1996 and 2016. And, when using a more inclusive measure of predicted internet access that takes into account other demographic variables, such as race and education, we find that the demographic groups least likely to have received internet access in 1996 have experienced larger changes in polarisation than the demographic groups most likely to have received internet access in 1996. If direct access to the internet or social media were the primary drivers of political polarisation, we would expect to see the opposite trends. The elderly (65+) are roughly half as likely to have seen campaign news online in 2016 as young adults (18-39) and even less likely to use social media, yet it is these older age groups that have experienced the largest changes in political polarisation. Given these facts, one would need to have large heterogeneity in the response to internet access across age groups or substantial spillovers across age groups in order to construct a narrative where the internet or social media are the primary drivers of contemporary changes in political polarisation. These findings do not rule out any effect of the internet or social media on political polarisation. In fact, there is some evidence that the internet may have a small effect. Lelkes et al. (2017) use plausibly exogenous variation in right-of-way legislation to argue that broadband expansion modestly increases affective polarisation in treated counties, but temper their findings by saying “we do not think broadband is the only, or perhaps even the primary, cause of the rise in partisan ill will… Affective polarisation began to increase at least two decades before widespread Internet use.” Furthermore, these results do not explain the differences in affective polarisation across age groups. A similar narrative blames the 2016 election outcome on the internet and social media. After the election, Hillary Clinton suggested that fake news and Facebook contributed to her loss (Ingram 2017). In our paper, we examine the impact of the internet on the 2016 election by comparing vote shares across demographic groups. We find no evidence that Donald Trump received a greater proportion of the vote than his predecessors from demographic groups with high propensities to use the internet relative to those with low propensities. In fact, our point estimates suggest the opposite pattern – Trump did relatively worse among those with high propensities to use the internet and among actual internet users. Hampton and Hargittai (2016) reach similar conclusions from examining the percentage of Trump supporters using social media and the differences in vote shares across demographic groups. There are substantial divisions between political groups in the US today, and these divisions do not appear to be lessening. When trying to understand the rise of political polarisation or the success of populist presidential candidates, pointing to the internet and social media may be tempting. However, basic trends across demographic groups do not support a narrative where the internet plays a large role in explaining either phenomenon. As media consumption continues to shift from traditional media to these newer platforms, we should continue to monitor their usage and impact on the political sphere. But, until there is evidence that changes these conclusions, we should not be hoping for alternative Facebook feeds or Google search engines to solve our political problems. Abramowitz, A I and K L Saunders (2008), “Is polarization a myth?”, The Journal of Politics 70(2): 542—555. Adamic, L A and N Glance (2005), “The political blogosphere and the 2004 US election: Divided they blog”, Proceedings of the 3rd International Workshop on Link Discovery: 36–43. An, J, D Quercia and J Crowcroft (2014), “Partisan sharing; Facebook evidence and societal consequences”, Proceedings of the Second ACM Conference on Online Social Networks: 13–24. Bakshy, E, I Rosenn, C Marlow and L Adamic (2012), “The role of social networks in information diffusion”, Proceedings of the 21st International Conference on World Wide Web: 519–528. Boxell, L, M Gentzkow and J M Shapiro (2017), “A note on internet use and the 2016 election outcome”, Working Paper. Boxell, L, M Gentzkow and J M Shapiro (forthcoming), “Greater internet use is not associated with faster growth in political polarization among US demographic groups”, Proceedings of the National Academy of Sciences. Colleoni, E, A Rozza and A Arvidsson (2014), “Echo chamber or public sphere? Predicting political orientation and measuring political homophily on Twitter using big data”, Journal of Communication, 64:317–332. Conover, M D, J Ratkiewicz, M Francisco, B Goncalves, F Menczer and A Flammini (2011), “Political polarization on Twitter”, Fifth International AAAI Converence on Weblogs and Social Media. Fiorina, M P, S J Abrams and J C Pope (2010), Culture war? The myth of polarized America, London: Longman Publishing. Flaxman, S, S Goel and J M Rao (2016), "Filter bubbles, echo chambers, and online news consumption", Public Opinion Quarterly 80(S1): 298–320. Gentzkow, M (2016), “Polarization in 2016”, Toulouse Network for Information Technology Whitepaper. Gentzkow, M and J M Shapiro (2011), “Ideological segregation online and offline”, Quarterly Journal of Economics, 126(4): 1799–1839. Gruzd, A and J Roy (2014), “Investigating political polarization on twitter: A Canadian perspective”, Policy & Internet 6(1): 28–45. Halberstam, Y and B Knight (2016), “Homiphily, group size, and the diffusion of political information in social networks: Evidence from Twitter”, Journal of Public Economics 143: 73–88. Hampton, K N and E Hargittai (2016), “Stop blaming Facebook for Trump’s election win”, The Hill. Ingram, M (2017), “Hillary Clinton blames the Russians, Facebook, and fake news for her loss”, Fortune. Iyengar, S, G Sood and Y Lelkes (2012), “Affect, not ideology: A social identity perspective on polarization”, Public Opinion Quarterly 76(3): 405–431. Lelkes, Y, G Sood and S Iyengar (2017), “The hostile audience: The effect of access to broadband internet on partisan affect”, American Journal of Political Science 61(1): 5–20. Mason, L (2015), “I disrespectfully agree: The differential effects of partisan sorting on social and issue polarization”, American Journal of Political Science 59(10): 128–145. Pariser, E (2011), The filter bubble: What the internet is hiding from you, New York, NY: Penguin Press. Pew Research (2014), Political polarization in the American public, Research report, Pew Research Center. Pew Research (2016), Partisanship and political animosity in 2016, Research report, Pew Research Center. Sunstein, C R (2001), Republic.com, Princeton, NJ: Princeton University Press. Sunstein, C R (2007), “Sunstein on the internet and political polarization”. Sunstein, C R (2009), Republic.com 2.0, Princeton, NJ: Princeton University Press. Sunstein, C R (2017), #Republic: Divided democracy in the age of social media, Princeton, NJ: Princeton University Press.